"The Dead Sea Scrolls and the Hasmonean State is the first book dedicated solely to the question of how we can learn political history from the Qumran scrolls. This English edition of Eshel's 2004 Hebrew publication updates their earlier work with more recent scholarship, now also including English-Language resources." --BOOK JACKET. - Publisher The Dead Sea Scrolls and the Hasmonean State is the first book dedicated solely to the question of how we can learn political history from the Qumran scrolls. This English edition of Hanan Eshel's 2004 Hebrew publication updates that earlier work with more recent scholarship, now also including English-language resources. 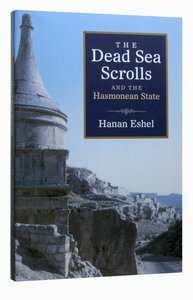 About "The Dead Sea Scrolls and the Hasmonean State"
The Dead Sea Scrolls and the Hasmonean State is the first book dedicated solely to the question of how we can learn political history from the Qumran scrolls. This English edition of Hanan Eshel's 2004 Hebrew publication updates that earlier work with more recent scholarship, now also including English-language resources. Hanan Eshel was associate professor in the Department ofLand of Israel Studies and Archaeology at Bar-IlanUniversity, Ramat Gan, Israel. He published extensively onthe Dead Sea Scrolls and conducted many excavations at bothQumran and the Refuge Caves used by Jews during the BarKokhba Revolt.